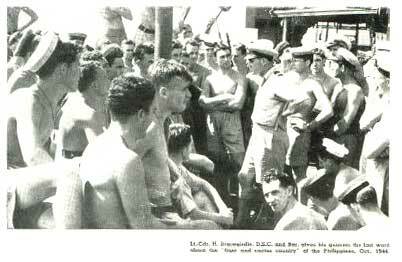 Ahoy - Mac's Web Log - Introduction to stories of Commander Warwick Bracegirdle DSC ** RAN. Introduction to stories of Commander Warwick Bracegirdle DSC ** RAN. "Gentlemen Cordite"
As a Lieutenant RAN, I was fortunate in late 1944 to be appointed to the crack 8 inch cruiser of the Royal Australian Navy, the fabulous HMAS Shropshire. This ship at the behest of Winston Churchill had been gifted to our Navy as a replacement for her sister ship HMAS Canberra, sunk at the Battle of Savo Island on the 9th. of August 1942 with the loss of 84 Officers and sailors. Many of Shropshire's crew had served in Canberra, as had I. Now Shropshire was many things, not only a happy and a lucky ship, but a most efficient fighting unit, she had been in every Pacific landing, bombarding before the troops went ashore, shooting down Japanese aircraft, and had played a big role at that surface action, the last "Great Sea Battle in Naval History, the Battle of Suraigo Straits." A main reason for her success was the wonderful gunnery department, lead by that legendary Naval and Specialist Gunnery Officer, Lieutenant Commander Warwick Bracegirdle, RAN. In his WW2 service Braces as he was affectionately known, won not one, not two, but three Distinguished Service Crosses. A most unusual feat. He had hand picked most of his Gunnery ratings, being friendly with the drafting officer at Flinders Naval Depot, where every one in the RAN does their training. I am proud to have served with this wonderful man. Post war, Braces went off to live in a small village in England, and he died age 80. Nicholas, his second son contacted me recently from UK, as a result we decided to publish these stories on AHOY, to honour Warwick, and give them a wider readership. Terry Kearns from Atlanta, and myself are delighted and honoured to bring them alive. Braces revs up his gunnery team before the Leyte landings in the Phillipines in October 1944.